It's storm season again! When the cold arctic air from Canada and the warm tropical winds from the Gulf of Mexico meet, this can cause major weather disturbances in North Texas. As everyone who's lived here a while knows we can see all kinds of damaging weather from torrential rains, ice, sleet, hail, high winds and tornadoes. When these storms hit SERVPRO of Lake Arlington is ready to clean up the mess and make it "Like it never even happened". With over 40 franchises in the Dallas Forth Worth metroplex and our expert storm team always on the ready SERVPRO of Lake Arlington has the resources available to handle any size disaster. Our highly trained technicians will restore your property while providing excellent customer service in the process. 24/7 we are here for you. SERVPRO of Lake Arlington is proud to announce the completion of our on-site Ozone Room! Ozone treatment is a powerful way to eliminate odors without the use of chemicals or masking deodorizers. The ozone room can be used after a fire to get soot smells off of contents. You set the contents in the room, set the timer, and let it work its magic! The ozone room works by utilizing an electrical current and breaks down odors. The ozone room is a very important tool that SERVPRO of Lake Arlington utilizes when cleaning contents and deodorizing because it kills the odors at the source without using harsh chemicals. Here is the science behind the ozone room: Normal oxygen is mixed with an electrical current such as lightning transforming normal oxygen into activated oxygen. The activated oxygen is what cleans the air, contents, etc. This is why it always smells so fresh outside after a thunder storm! The activated oxygen from the electrical currents is cleaning the air naturally! Electricity is nature's way of cleaning the air. Here at SERVPRO of Lake Arlington, we take special care of our commercial customers. Water, bio, and fire emergencies can happen anytime and anywhere. We want you to have all the knowledge you need to be prepared in the event of a commercial loss. One way to share with and educate potential customers are through lunch and learns. 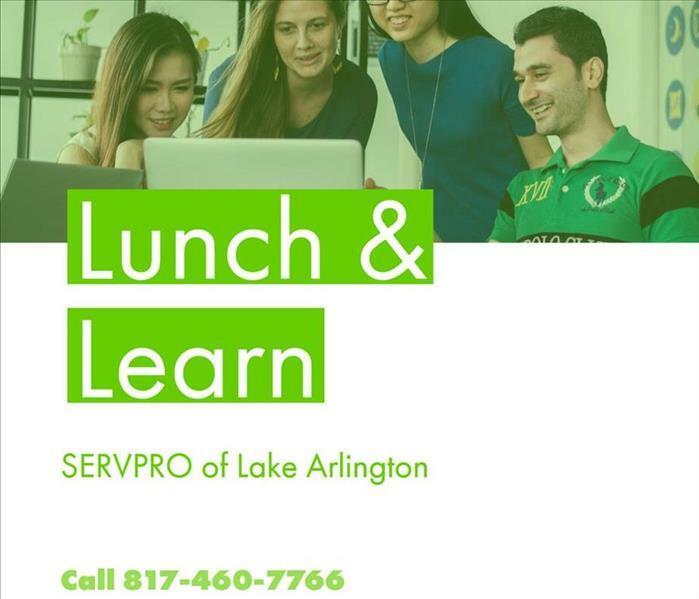 During a L&L, and a SERVPRO of Lake Arlington representative schedules a time to bring lunch to your insurance or real estate office. During the meal, the representative will get a short presentation on services, hand out literature, and leave your team with plenty of SERVPRO of Lake Arlington goodies! If you would like to schedule a Lunch and Learn with one of our representatives, call us today! 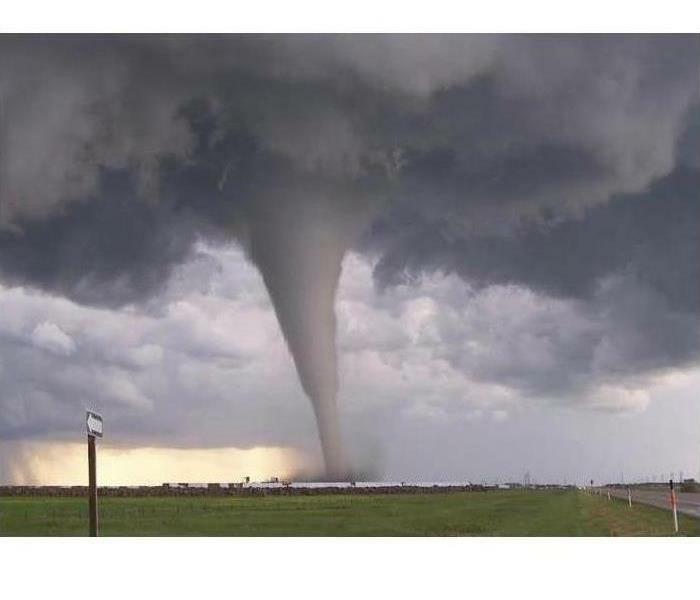 Unexpected emergencies like severe weather call for immediate action! Your Lake Arlington SERVPRO knows that immediate reaction is important in helping to get life back to normal after storm damage has occurred. SERVPRO of Lake Arlington will always strive to contact our customers within 1 hour from the notice of loss to arrange for service! SERVPRO of Lake Arlington will be on site within 4 hours to begin mitigation after storm damage has occurred. Our SERVPRO professionals will also provide verbal briefing of scope to you within 8 business hours of on- site arrival. 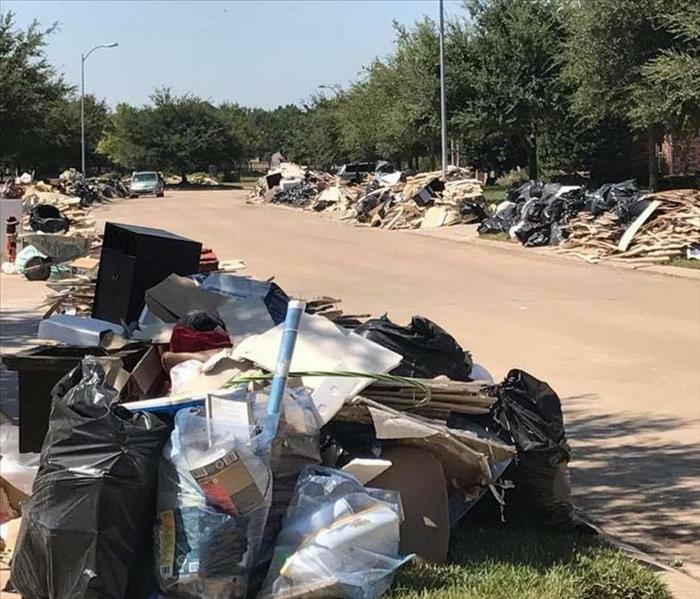 SERVPRO of Lake Arlington can also perform pack-out services, which is removing salvageable personal property from the affected area for off-site cleaning and storage. When disasters strike, SERVPRO of Lake Arlington is there to help! There's never a convenient time for fire or water damage to strike your business. We understand that every hour taken away from productivity equals lost revenue. That's why the franchise professionals at SERVPRO of Lake Arlington has your Dallas/Fort Worth area business covered from the time of loss to job completion. Give us a call at 817-460-7766 for 24-hour emergency service. Our commercial loss team is standing by to return your business to preloss condition. 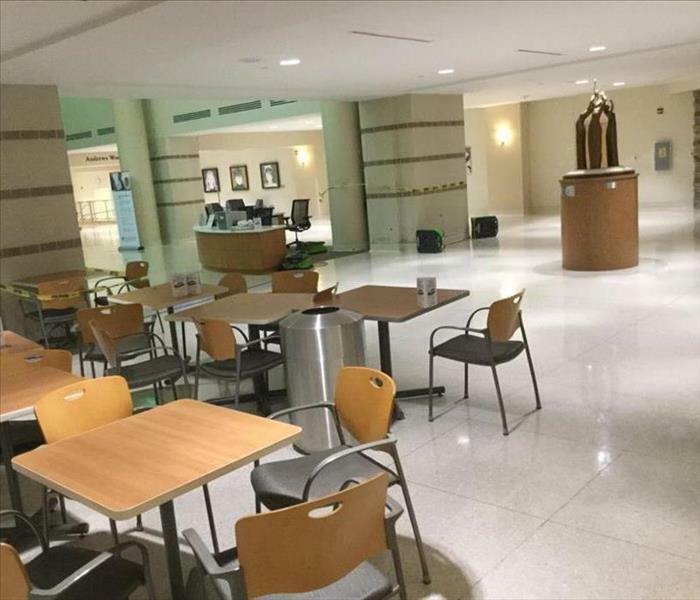 From schools to movie theaters, office complexes to hospitals, no job is too large for SERVPRO of Lake Arlington. After the police have finished processing a crime or accident scene, the cleaning and restoration process can begin. Many times, crime and accident scenes have blood and other biohazard contaminants that pose a serious health risk. 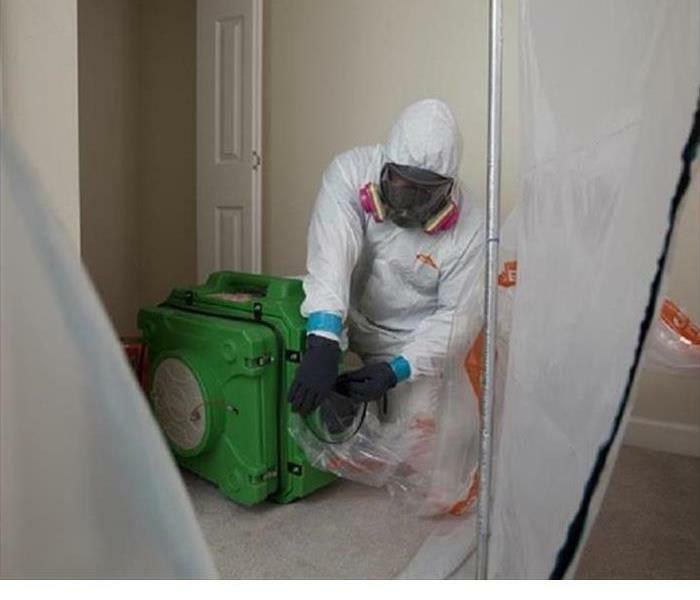 SERVPRO of Lake Arlington will respond immediately and have the specialized training, protective equipment, and experience to safely clean trauma and crime scenes. SERVPRO of Lake Arlington technicians follow OSHA and EPA protocols to help transform an unsafe environment back into a clean, safe home or business. Their first focus is always safety, since crime or accident scenes may involve bloodborne pathogens, harmful chemicals, and other dangers. SERVPRO of Lake Arlington will always treat your property and the people involved with the greatest empathy and respect in the face of trying circumstances. Contact SERVPRO of Lake Arlington for mold remediation services. SERVPRO of Lake Arlington specializes in mold cleanup and restoration, in fact, it’s a cornerstone of our business. Our crews are highly trained restoration professionals that use specialized equipment and techniques to properly fix your mold problem quickly and safely. Everyone knows a very high percentage of the rain that falls during the year falls in the spring. In Texas we get through the storms and heavy rain by looking forward to the beautiful bluebonnets they help produce along our highways and rural fields. The heavy rains can also cause water damage in homes. 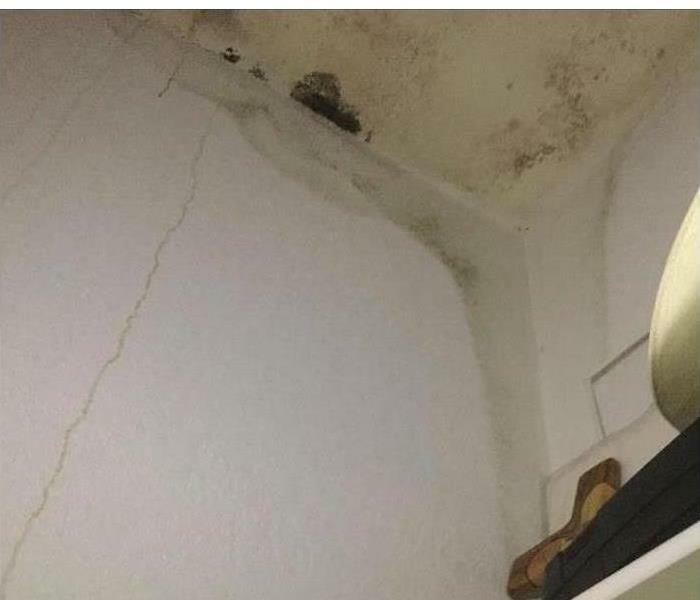 Sometimes this damage occurs in a vacation home or in an area of the home that is not discovered until later, giving mold a chance to grow and take hold. SERVPRO of Lake Arlington are experts in both water damage and mold mitigation and remediation. Our professional technicians will restore your water damage or mold issue while providing excellent customer service. Because I grew up in Houston, working with SERVPRO of Lake Arlington disaster clean-up after Hurricane Harvey got emotional for me. . A customer asked me, "why would a marketing professional drive all the way to Houston to walk door to door through muck and debris? " why? Because I watched my hometown go underwater from 400miles away, completely powerless to help. I watched people get pulled out of the neighborhoods where I went to school, played softball, and had my first communion. My entire childhood engulfed in the floods. I couldn't pull Houston out of the storm, but I can help her rebuild. 4/2/2019 - Storm Season is Here Again! 4/2/2019 - Brand New Ozone Room! 3/15/2019 - Got Mold? What Now?